Proprietary Name: Alcohol Free Hand Sanitizer What is the Proprietary Name? 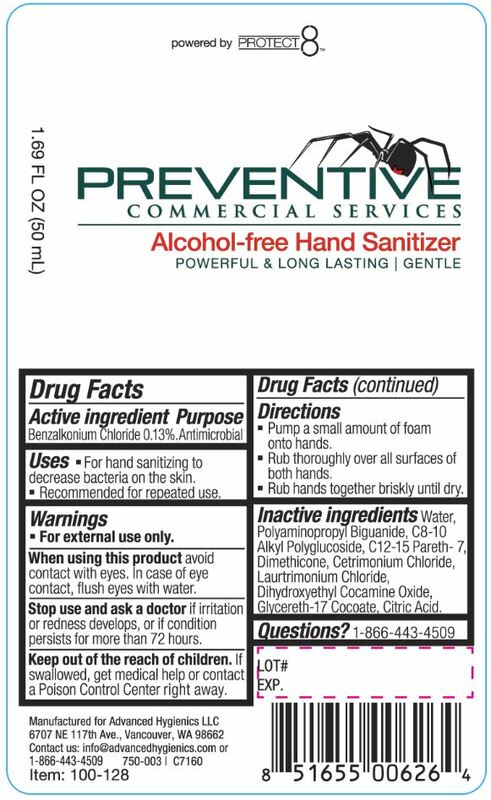 Alcohol Free Hand Sanitizer with NDC 63002-005 is a a human over the counter drug product labeled by Advanced Hygienics Llc. The generic name of Alcohol Free Hand Sanitizer is benzalkonium chloride. The product's dosage form is liquid and is administered via topical form. UsesFor hand sanitizing to decrease bacteria on the skin.Recommended for repeated use. When using this product avoid contact with eyes.In case of eye contact, flush eyes with water. Keep out of the reach of children.If swallowed, get medical help or contact a Poison Control Center right away. DirectionsPump a small amount of foam onto hands.Rub thoroughly over all surfaces of both hands.Rub hands together briskly until dry. Inactive ingredientsWater, Polyaminopropyl Biguanide, C8-10 Alkyl Polyglucoside, C12-15 Pareth-7, Dimethicone, Cetrimonium Chloride, Laurtrimonium Chloride, Dihydroxyethyl Cocamine Oxide, Glycereth-17 Cocoate, Citric Acid.